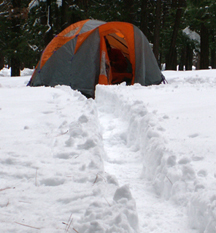 Winter camping in Yosemite Valley is not a true wilderness experience. Some years there is lots of snow, some years we have found sunny early spring weather. There are restrooms and they’re heated except during power outages. You’ve got a car to bring lots of stuff instead of just a backpack. There are restaurants to bail to if an in-camp meal is a disaster or if you just don’t want to cook. There’s usually a laundromat open most of the day where you can dry some damp clothes. There is an emergency medical center a mile from the campground and a 24 hour ambulance service in the park. Most trips have had two or more Red Cross first aid and/or CPR instructors on them, sometimes including someone who was/is an EMT or Paramedic. The free shuttle bus runs most of the day/early evening, in all kinds of weather and stops at the restaurants, shower house, grocery stores, laundromat, visitor center… a second free bus goes to the ski resort/ranger snow shoe walk. 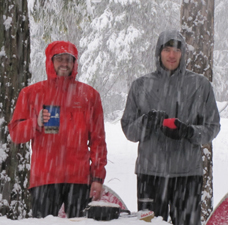 BUT winter camping is still something to take seriously. A small mistake you make will be exaggerated by the conditions. Rockfall is more likely in the winter. Previous years we’ve found that if we all work together, and have a cooperative attitude, then we can stick out any trouble or just have more fun. That’s why so many pages at this site are required reading for anyone who goes on the trip. And that’s why we hope everyone will support the idea of everybody helping out everybody else. Even if it’s good weather, it can change quickly, so tents in place with rain flies securely on should be one of our first priorities, if there are large number of people camping each group often helps the next arrivals to get settled. As more people arrive, they will walk around and create paths through the snow (if there is much snow) from campsite to campsite to restroom, campfire, etc. This will make walking after dark much easier. Snow plows work on the main roads first and then get to the campground loop road, (or sometimes don’t have the time to get to the campground loop road). When they push each day’s snow to the side, it can make a wall in some places a couple of feet high. Some of these could be at campsite parking places, so you may have to shovel some snow to be able to park. 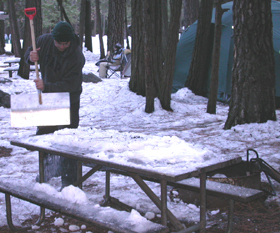 Before it gets dark people try to get at least one campfire built, snow will be shoveled from off at least one picnic table, and a dining canopy will go up over the table. Stoves will be set out and started. Any car arriving after dark should have gotten fast food or eaten something they brought with them. Yes, you could still expect to make dinner, and if people are not heading for bed they might share already set up stoves with you, but it’s not a safe practice to arrive really hungry and still need to unpack in the dark. If we keep to our plan of mutual help, the last arrivals can expect to be met by lots of people ( if we have a lot of people camping) with flashlights ready to stomp down any deep snow to a few inches in large spaces for the last tents (or maybe we will have anticipated the arrival of the bigger tents and already have spaces stomped). The 1968 Cadillac sedan with maybe six inches of ground clearance will finally make it into a campsite parking space and everyone will enjoy the festival atmosphere of its arrival–if we all plan for and choose that atmosphere. No one should to go for hours with cold or numb toes because they’re too shy or too macho to speak up. If you forgot something, ask around. Someone might have brought a spare or maybe we can think of something that will do until morning when the stores open. The success of this trip begins with each member of the trip understanding what to bring and what rules are special to Yosemite. It all begins by actually reading all the snow camp website pages, not just skimming through them. There will be a written test to pass before you can sign up for the trip. We require seeing your rain gear ( waterproof hooded rain jacket and rain pants big enough to fit over your warm stuff) when you sign up. If you don’t carry your raingear on a hike and it starts to rain, your clothes can get soaked through. In the cold temperatures of the mountains, winter or not, you could die from exposure. People on our club winter trips are required to carry their rain gear and a flashlight (electric torch) or headlamp at all times. Doing a night hike? In thick fog or blowing snow you will see better to hike/walk if you put your flashlight(electric torch) or headlamp on a belt at your waist instead of on your head. If it’s slippery, and it probably will be, people often night hike on the road to Mirror Lake arm-in-arm in groups of two or three or four or… okay, not twenty. 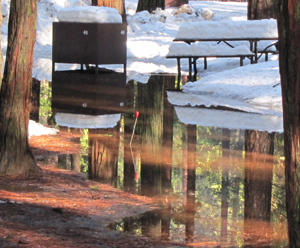 Many of our winter Yosemite valley trips have had mostly nice, sunny, cold weather with some snow on the ground (one year a settled foot and a half, one year only some patches of snow here and there). But we could have a repeat of 14 inches of snow in one night (followed by a gorgeous, sunny picture-perfect day). Other times we’ve had precipitation that fell as rain during the day, slush in the afternoon and snow at night. 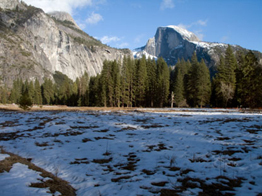 Average temperatures in Yosemite in January are a high of 49 and a low of 26, February high 55, low 28. We regularly have freezing temps overnight. One year when everyone camped a bunch of the campers decided they had enough weather the first night, and they got cabins for the second night. 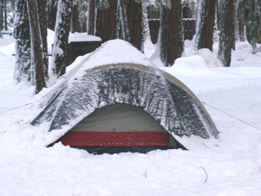 They complained that they were not warm enough in the tents (but they also later complained that the cabins were too warm). The advisor, of course, stayed in the campground. The rest of the students who stayed to camp seemed proud of themselves. I can still remember lying in my sleeping bag, just starting off to sleep. The wind was busy in the trees and a really big burst of hail hit us…others in our group started cheering. As the snow builds up on the cliffs, we’ve heard small and large avalanches coming down off the cliff walls, some only minutes apart at night (a good reason to do night hikes close to the campground/main road, not close to cliff walls). 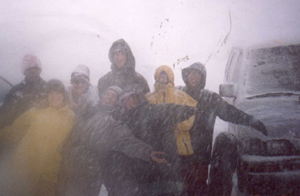 Sleet, wind and other “interesting” weather (including snow that bites at your face if you are out in it – wear a balaclava or a scarf wrapped around your face) are also possible, but rare (weather does not cancel Outdoor Club events unless the Rangers say to move or go home). 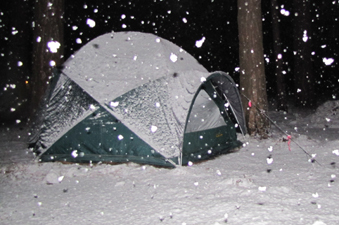 Even with early-spring-type weather and very little snow on the ground at the campsites it is always quite cold at night. You will not get much sleep without at least one insulating pad under you. There is a slight chance of our experiencing the “Mono winds.” These are up to 70 m.p.h. and have knocked down trees. At the start of past Mono winds the Rangers moved people from the campground to the Curry Village (Half Dome village) parking lot, site of an old apple orchard, so no tall trees would threaten campers. They also moved people from their hotel rooms and cabins into the cafeteria, etc. One year the winds were high until 2 a.m. and only the campers got sleep; the hotel guests were kept from their rooms. This means the possibility of no picnic tables or fire rings, so bring lots of lunch box-type food and trail snacks, so you can eat a cold dinner if necessary. Then just plan on spending the evening in your tent solving the world’s problems, reading magazines or playing board games or cards while the storm whirls around you. Previous Mono winds we have experienced lasted only part of one day, not a whole weekend. When you look at the weather report in advance of the trip, please note it can change quickly, and note that Yosemite valley is about 4,000 feet elevation and the Badger Pass Yosemite ski resort is 7,200 to 8,000 feet elevation. When it is raining in Yosemite valley it can be snowing at the ski resort and snowing part way up a trail you might choose to hike (the top of upper Yosemite Falls is at 6,400+ feet). At the end of the 2019 trip it started snowing heavily “SNOWZILLA“. . . and for 2 1/2 days all roads out of Yosemite Valley were closed and all campgrounds were closed due to risk from falling trees, but the students got out just in time. If you spill liquid fuel on your hands when handling a stove in the cold, you can get instant frostbite when it evaporates quickly. The fuel can damage or permanently wreck your fancy tent fabric, or your fancy clothing, so refuel carefully outside of the tent. Accidental burns or carbon monoxide poisoning from cooking inside a poorly ventilated tent are distinct possibilities, so no cooking in the tents. While out in the weather keep an eye on each others’ noses, ear lobes and fingers. Often the person with frostbite starting won’t notice it, but a partner will notice color change to white, waxy or grey and mottled. You’ll be busy having fun, so you need to think to stop once in awhile and think about your skin and wiggle your toes. Remember, wherever you get frostbite, you will be very susceptible to getting it in the same place again. 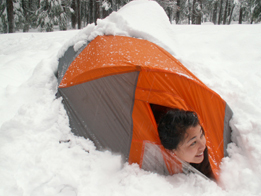 Shivering is your body’s last line of defense against hypothermia, so never ignore it in yourself or a friend. But you can get hypothermic without shivering, so watch out for partners who seem to have become clumsy walking or on their skis, often a first sign of major trouble. Some people think that because alcohol makes you feel warm it would be a good idea in the outdoors in the cold. The reason drinking beer or stronger alcohol makes you feel warm is that it dilates blood vessels next to your skin. It makes them bigger, so more blood moves next to your skin, and more warm blood means you feel warmer. BUT you are also losing crucial inner core body heat at an alarming rate. So you are actually getting colder even though you have the sensation of being warmer. — USE OF ALCOHOL IN THE COLD KILLS. There is often no first aid to be given. “Lions are a normal and important part of Yosemite, however, the presence of lions, especially near developed areas, requires that we take precautions. – Keep children close to you. Do not allow them to run ahead or lag behind on a trail. – Never feed wildlife – this helps discourage them from frequenting developed areas. Remember – smaller animals are prey to larger predators. Attracting small animals in turn attracts large animals. – Please keep pets indoors or on a leash and feed pets inside. – Hiking or running alone is not recommended, particularly in morning and evening hours. – Shout in a low voice and wave your arms or hold your coat open. Your goal is to make yourself look as large and threatening as possible. – Maintain eye contact with the lion, and do not crouch down. – Throw sticks or rocks at the lion. – Pick up or restrain small children to keep them from panicking and running. – If a lion attacks, fight back! Attack from a mountain lion is an extremely unlikely event, but use of the above recommendations can further reduce the chances of injury and allow humans to more safely share the park with these spectacular animals. Below: on the way back from an early morning walk to Mirror Meadow we found cougar tracks crossing our path that had not been there on the way in. A coyote’s or dog’s tracks would have had distinct claw marks, so this must have been a big kitty. Info about keeping coyotes, raccoons and bears out of our food supplies (and out of our cars and tents) is at A problem and its solution which is another page you must read before the trip. Winter trails, as well as sidewalks and parking lots, are sometimes icy or slippery, so wear high traction boots or shoes (not flat-soled street shoes). Be prepared for big weather changes. You might find warm conditions at mid-day and be hiking in a tank top, only to need all your layers and wet/windy weather gear an hour later. When hiking trails along cliff walls be prepared for chunks of falling rocks, ice or snow. The Four Mile Trail to Glacier Point and the John Muir Trail between Clark Point and the top of Nevada Fall are always closed for the winter. The Half Dome cables are always down for the season. The Rangers really don’t want to do a winter night time rescue and therefor don’t want anyone to try to do the Half Dome trail in winter. Other trails may be open, but we can still expect some potential ice fall. 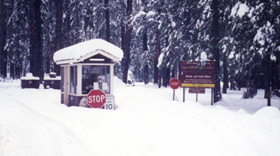 The club requests that any hikers who go above the valley floor, or any distance from the shuttle bus route, or any cross-country skiers away from the heavily used areas at Badger (ski area) go in groups of four or more in case of problems. It’s much better to leave one person with the hiker with the sprained ankle, and have two go out together for help, than to face emergencies with only two people. You can start out in the morning in fabulous sunny weather, and be totally immersed in winter before noon. If the trail is clear enough, we almost always hike the trail from the valley to Columbia Rock and beyond to at least the base of upper Yosemite fall. Some people go beyond to the top of upper Yosemite fall. Along the way, near the base, if you are in good shape and careful, you can go off trail (please, only about ten feet, stay among the giant boulders) into a big section of boulders and see the falls up closer. We have gotten great pictures of the rainbow in the falls and closeups of the snowcone with telephoto lenses. In another rescue report the park said “scrambling off trail is one of the leading causes of serious injury and death in Yosemite”. People on the Yosemite Falls hike are often go a bit off trail to see better views of the rainbow/snowcone. A bit off trail is the farthest they should go, trying to go all the way down to where the waterfall flows is risking too much. Unfortunately, some people don’t stay in the relative safety of the boulders area and they die doing this. Yosemite National Park news releases described three such deaths (as paraphrased below). 1) A twenty year old guy was hiking with four friends on the Yosemite Falls Trail. He and one other person stopped at the base of the Upper Yosemite Fall. The pair scrambled down into the basin at the bottom of the waterfall, when he slipped and stumbled, falling 40 feet to his death. The National Park Service’s Search and Rescue team responded by helicopter to the incident. He was pronounced dead at the scene about 1:30 p.m., having suffered a head injury. 2) A 23 year old man died while hiking off-trail on the Yosemite Falls trail. He fell into Yosemite Creek. The accident, which occurred around 1 p.m., was reported to rangers at about 2 p.m. by friends who hiked back down the 3.6 mile trail. The young man, hiking alone, had apparently been trying to get to the edge of Yosemite Creek when he slipped and tumbled approximately 100′ before landing in the creek. His body was not retrieved by a rescue crew until 5 p.m. About 20 rescue workers flew into the area by helicopter and then swam in a pool of water to recover his body in a pool in the rough, middle section of the Yosemite Falls. The preliminary cause of death appears to be drowning. 3) two Boy Scouts were hiking on the Yosemite Falls trail, approximately 300 yards above Columbia Point…left the trail and attempted to take what they believed was a short cut. Both boys fell due to the steep terrain. One of them was able to self-arrest after a drop of approximately 10 feet, but saw that his companion continued over the edge and fell about 300 feet. The victim was located by rangers at the bottom of the cliff in an area just west of the Munginella climbing route. Advanced life support measures were employed for approximately 15 minutes before the boy was pronounced dead. A preliminary finding of the investigation into the incident by investigators and the medical examiner has ruled the death as accidental. stay with a group of at least four people, either everybody goes (slightly) off trail, or no one does (with four people there is one to stay with someone injured and two to go out for help if cell phones don’t work, and they often don’t work). SOME THOUGHTS ON HIKING TOGETHER AND DEPENDING ON EACH OTHER. We require that people hike in groups of four or more on our winter trip, sand it’s hard to get lost on the hiking trails or especially the groomed ski trails in Yosemite, so your survival will probably not be on the line. But some rules for real wilderness travel still apply. Be sure you and your hiking/skiing partner (or group) have the same goal. Will you be taking your time, taking pictures, listening to the snow fall? Or do you have a specific destination within a certain time limit? Will you keep to obvious trails or try off trail and/or cross country? If you don’t all agree before you start, maybe you should be in different groups. Remember that sometimes the time to turn back is before you leave. If you’ve planned on spending 100% of a trip with your best friend or future spouse, re-think it. One morning it may be important for one person to tell the other: “I want to rest today and hang around camp, so you go on the day hike to Overly-High Peak with the others.” The best way to say this is to not make your partner feel as though he is abandoning you. If you want to risk life and limb on a foolish adventure on your own, do it on your own time. It’s uncool to commit to a group ski/hike and then announce “I won’t be going back with the rest of you; I’ve decided to climb Screaming Glacier on my own without proper equipment to show how macho I am.” This leaves your companions feeling responsible if they don’t watch out for you. Be honest. Don’t be too proud to admit you have a pulled muscle or numb toes and need help, or to say something looks too dangerous. When your partner or someone in your group is honest with you, take them at their word. Help the person with the pulled muscle without bruising their ego and making them wish they’d kept quiet. Never pressure someone into trying something that looks too dangerous to them. But know the exceptions to the above. Sometimes you have to do something risky because there is a greater risk if you don’t. First aid smarts say don’t take someone you suspect of being hypothermic at their word when they say they’re OK.
Behave at all times in a manner that reflects favorably on mountaineering. On summer trips the club has had people who ignored the safety stuff, and other people took care of them. This is winter. People will probably be nice and help you out no matter how reckless or unprepared you are. But they will have read this trip info and won’t be real convinced if you try too many excuses. And most will carry only enough gear for themselves and not want to share. “There are no scheduled winter patrols, so be prepared…Plan your trip sensibly anytime you go out, keeping in the mind the experience level and conditioning of the weakest member of your group. Don’t separate from other members! trails are slippery or hidden, visibility can be poor, and landmarks look very different under snow. 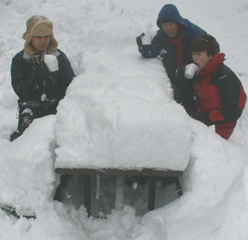 New hazards such as falling rock or ice, snow bridges, or hollow spots under the snow pack can cause problems. be prepared for both ends of the weather spectrum each time you go out. much of your body’s heat from your head, so a warm hat is a necessity. 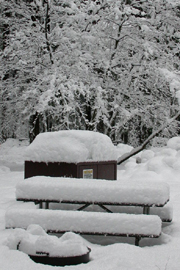 weather activities–you need a gallon of fluids a day during strenuous winter activity. Creeks will be frozen, so tank up by drinking as much as you can before leaving and carry a couple of quarts of water for a full days outing. wilderness. If you get lost, or must bivouac, stay put and stay dry. whistle, repeated often, will help searchers find you. Stomp out a big "X"
in the snow to help the helicopter find you if things go that far. Here are more rockfall safety tips from the Wilderness Safety Action Team. This text is from the official wording on the rock fall closures posted at trail barricades, but applies to all of us, all the time. on the time, location, and duration of the event. their surroundings and enjoy the park safely. climbing areas, or talus slopes. Prepare for winter driving has a link to bad weather driving tips, tips for using tire chains, tricks for dealing with frozen car locks, how to prepare your vehicle for winter driving, a winter survival kit for your car and what to do if you get stranded. NOAA weather radio in Yosemite is found at 162.450 MHz. “darkness began to gather for a chapter of snow; heavy cloud-masses rolled down the black-washed walls, circling cathedral rocks and domes, and hiding off all the upper brows and peaks. Thin strips of sunshine slid through momentary seams that were quickly blinded out. The darkness deepened for hours, until every separating shade and line were dimmed to equal black, and all the bright air of our gulf was sponged up, and fastened windless and pulseless in universal cloud. “It’s bound to snow,” said a mountaineer to me, as he gazed into the heavy gloom, “bound to snow when it gathers cloud material gradual as this. We’ll have a regular old-fashioned storm afore long.” Scarce had he delivered himself of this meteorological prophecy, ere the beginning flakes appeared, journeying tranquilly down with waving, slow-circling gestures, easy and confident as if long familiar with the paths of sky. Before dark they accomplished a most glorious work of gentle, noiseless beauty. Twelve inches of snow fell during the night and when morning opened our temple, there was more of beauty than pen can tell—from meadow to summit, from wall to wall, every tree and bush, and sculptured rock was muffled and dazzled in downy, unbroken, undrifted snow. Transparent film-clouds hung in the open azure or draped the walls, the gray granite showing dimly through their fairy veil. 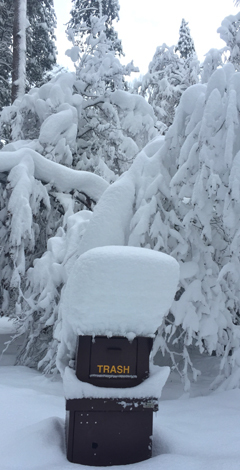 …one of the most picturesque snow storms I have ever seen. It was a tranquil day in Yosemite. About midday a close-grained cloud grew in the middle of the valley, blurring the sun; but rocks and trees continued to caste shadow. In a few hours the cloud-ceiling deepened and gave birth to a rank down-growth of silky streamers. These cloud-weeds were most luxuriant about the Cathedral Rocks, completely hiding all their surnmits. Then heavier masses, hairy outside with a dark nucleus, appeared, and foundered almost to the ground. Toward night all cloud and rock distinctions were blended out, rock after rock disappeared, El Capitan, the Domes and the Sentinel, and all the brows about Yosemite Falls were wiped out, and the whole valley was filled with equal, seamless gloom. There was no wind and every rock and tree and grass blade had a hushed, expectant air. The fullness of time arrived, and down came the big flakes in tufted companies of full grown flowers. Not jostling and rustling like autumn leaves or blossom showers of an orchard whose castaway flakes are hushed into any hollow for a grave, but they journeyed down with gestures of confident life, alighting upon predestined places on rock and leaf, like flocks of linnets or showers of summer flies. Steady, exhaustless, innumerable. The trees, and bushes, and dead brown grass were flowered far beyond summer, bowed down in blossom and all the rocks were buried. Every peak and dome, every niche and tablet had their share of snow. Those rumors about the dining conditions on club winter trips are unfounded.